The North Baton Rouge Industrial Training Initiative (NBRITI) graduated 15 electrical, 13 pipefitting and 12 welding students in its fourth cohort of the training program on Tuesday, Jan. 22 in the Baton Rouge Community College Magnolia Theater. Each graduate received National Center for Construction Education and Research (NCCER) Core, Level I and Level II certifications. Graduates are predominantly from North Baton Rouge. “Our partnership has been a springboard for workforce educational opportunities in North Baton Rouge, as well as the entire region. 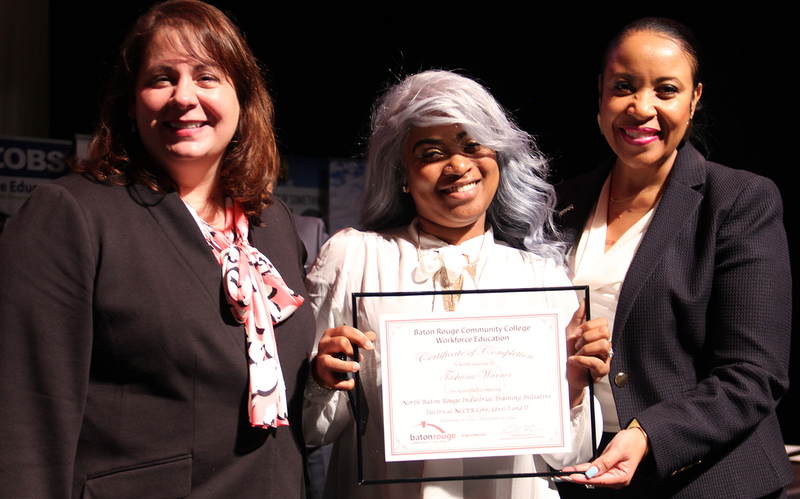 ExxonMobil’s continued commitment to bring together business and industry, education institutions and the community is the model of corporate citizenship,” said Baton Rouge Community College Chancellor Larissa Steib. The Initiative is working through its contractor partners to place all graduates in full-time positions with their firms. NBRITI continues to expand with each new cohort. With the addition of a millwright track, NBRITI was able to select 200 local students to be part of the program’s fifth training class. A record-breaking 800 applicants applied to be a part of the program’s fifth cohort, and Baton Rouge Community College will offer reduced-cost training opportunities for those students not accepted into the program. The NBRITI program began in 2012 spearheaded by ExxonMobil in an effort to better connect community members to industry jobs. The training is based at Baton Rouge Community College’s Acadian Campus and provides no-cost training for high-demand crafts. The program also incorporates a social skills component that offers ongoing tutoring, financial literacy training, and resume and interview assistance. The NBRITI is a collaborative effort comprised of diverse community, industrial, and educational partners throughout the greater Baton Rouge area, all committed to one goal: to provide a sustainable process to recruit, train and develop North Baton Rouge residents for successful careers with local industrial employers.